← Welcome to South London Slings! This is one of my personal wraps that I’ve decided to make available to the Library so that others can try it. It’s a beautiful woven wrap made by brand Bebina and is woven in gorgeous rainbow colours. 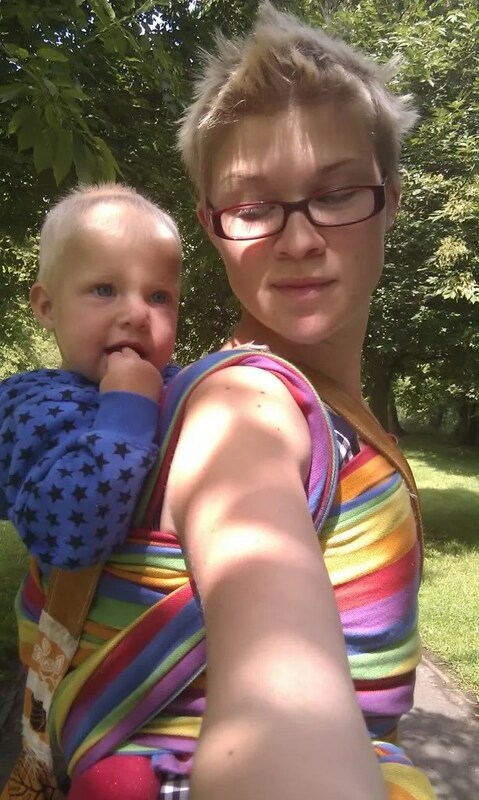 Here’s me with my 16 month old daughter, using the Bebina Rainbow woven wrap in a supportive and comfortable Double Hammock back carry. Suitable for: All parents and all children, depending on carry used. Ease of use: As with all woven wraps, it may require some practice to be able to use correctly. Once you have learnt, it is as easy as using a Mei Tai or any other carrier that ties on. As it is very long it can be less practical than other carriers when wrapping outside in wet, windy or muddy conditions. Comfort: Very comfortable and supportive to wear for a significant period of time. Overall Verdict: Lovely wrap in gorgeous, happy colours that’s wide, supportive and easy to wrap with. One of my favourites! To hire this baby carrier from the South London Sling Library, email southlondonslings@hotmail.co.uk to check it’s availability and find out more! This carrier has been bought with help from The London Door Company. This entry was posted in Pictures and Reviews and tagged Baby carrier hire London, Bebina, Carrier Reviews, London Sling Library, long wraps, Sling Hire, Sling Hire London, Sling Library, South London Sling Library, woven wraps. Bookmark the permalink. I am looking for a wrap like this one…where could I find one? Thanks for the review BTW! This wrap isn’t currently available new, but you can sometimes find this particular model and other similar rainbow wraps second hand on the FSOT (For Sale or Trade) section of forums like http://www.naturalmamas.co.uk. You could also post in the ISO (In Search Of) board of this and/or similar forums to see if anyone has one to sell. Other lovely and bright rainbow wraps you could look out for are the Bebina Old Rainbow (the one on the page is the ‘New Rainbow’ version), Lana Solara, Girasol #6 or Reimu. Girasol also do many, many other rainbowy wraps so there’s always something rainbowy out there to find! Sites like http://www.slingomama.nl often have standard and limited edition Girasol rainbows available to buy new. What a wonderful website and a great resource! I am using a Mai Tei for my four month old and really want to try out a wrap, and all sorts of different carrying positions so that I can feel confident. Went along to south london sling meet recently which was fabulous and have been navigating the natural mamas website since, thinking of what I might buy (and working out all the strange language used and so many different names of wraps!). Recently bought a pushchair for Eliza my daughter to sleep and hang out in on certain occasions. It does work. And it helps me relax a little as she is getting quite heavy and I do get exhausted with all the walking. I just don’t like the ease of the buggy though. I love carrying her. Think more versatility of carries will help me – would like to try her in a cradle position, forward carry and back carry with a wrap. What would you recommend for summer use?